Orthopaedic Innovation SmartGel™ synthetic osteoconductive gel is intended to be used as a bone void filler in areas that are not intrinsic to the stability of the bone. It is used in the treatment of osseous defects resulting from trauma, surgically created defects including metaphyseal bone defects, resection defects after osteotomy or bone harvesting, filling of bone voids after the removal of cysts and benign tumours and post traumatic bone defects. SmartGel™ is a suspension containing, in similar proportions by weight/volume two fine granule sizes of synthetic osteoconductive scaffold, in a reverse phase hydrogel carrier. It is entirely synthetic, manufactured using pharmaceutical grade compounds to exclude any possibility of allogenic/xenogenic contamination. A proprietary manufacturing process, strictly controlled by an ISO 13485 quality assurance system, ensures a highly pure and consistent material. SmartGel™ is presented in a polycarbonate syringe with a leur-lock connection and is supplied sterile, packed in a double pouch (inner foil and outer Tyvek) for single patient use. It offers all the benefits of a high quality ßTCP bone substitute with improved handling characteristics even when compared to allografts. Mimics the geometry and chemistry of human bone matrix to function as an osteoconductive template which is replaced by regenerating bone. The interconnected porosity of the gel is controlled to provide a three-dimensional scaffold that supports vascularisation and early cell attachment. Resorbed physiologically, optimising the microporus surface of the gel for early cell attachment. Orthopaedic Innovation Limited's Bonestitute™ Synthetic Bone Graft Substitute is a synthetic osteoconductive scaffold material. It has a three dimensional porous ceramic matrix which has been designed to mimic the function of human cancellous bone. 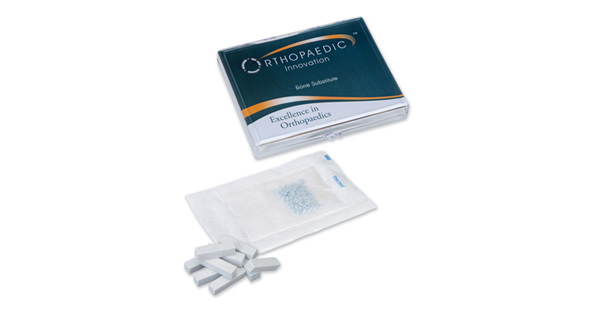 Intended to be used as a bone void filler in the treatment of osseous defects which occur as a result of trauma or surgically created defects, BoneStitute™ Synthetic Bone Graft Substitute has been successfully used to treat bone loss in these areas and to resolve conduction defects in non-unions and to restore conduction across osteotomy sites. In spinal fusion BoneStitute™ Synthetic Bone Graft Substitute has proved extremely effective at expanding the volume of available fusion material as it can be combined with any autograft harvested during the surgical procedure. A gamma sterilised product, BoneStitute™ Synthetic Bone Graft Substitute is available in unlimited quantities in numerous sizes and formats, the most common of which are listed below. Batches can also be custom made to individual specifications if required.